In the Australian War Commission Cemetery in the village of Sutton Veny lie 143 immaculately kept graves. Some of these soldiers, who fought thousands of miles from their homeland, would have been brought with battle wounds to the 1st Australian General Hospital, which transferred from France in 1919. However, it is a cruel irony that having survived the conflict and landed on safe soil, many of the Australian Soldiers injured out or waiting to be demobbed after the war were amongst the thousands who succumbed to Spanish Influenza. Angus Mcpherson is one of these soldiers. He died of influenza on 11 October 1918 in Sutton Veny Camp Hospital. His grave is one of those tended by village children each year, and his service is not forgotten. Charles Owen was born in 1890, in Manchester, UK – the second eldest of 10 children born to Elizabeth and Joseph Owen. In 1913 the family emigrated to Sydney Australia, and settled in the suburb of Burwood, from where, aged 25, Charles worked as a railway porter. 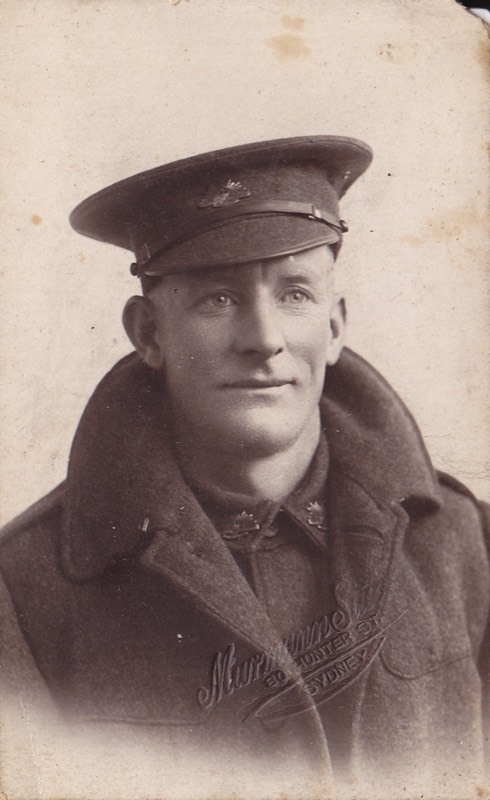 Charles Owen in his AIF uniform. The burn mark was likely caused by a cigarette. 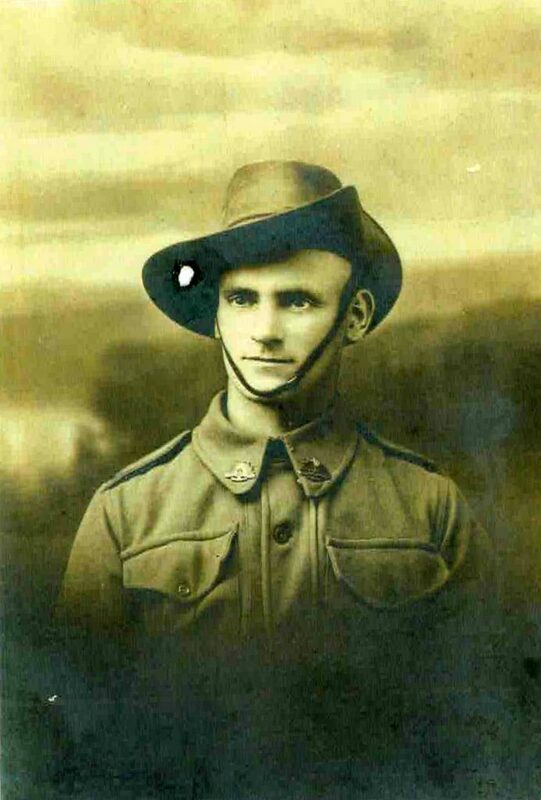 On 5th August 1915 Charles enlisted and was assigned to 2nd Battalion Australian Imperial Force, with whom, in 1916 he left Australia bound for Cairo and Alexandria. Quickly the battalion found itself in France, and Charles joined allied troops on the Western Front as a stretcher-bearer. From here he wrote many letters home, telling of his experiences. After 3 years of successful service, Charles, now a Corporal, returned to the UK at Sutton Veny, where the Australian General Hospital was based. 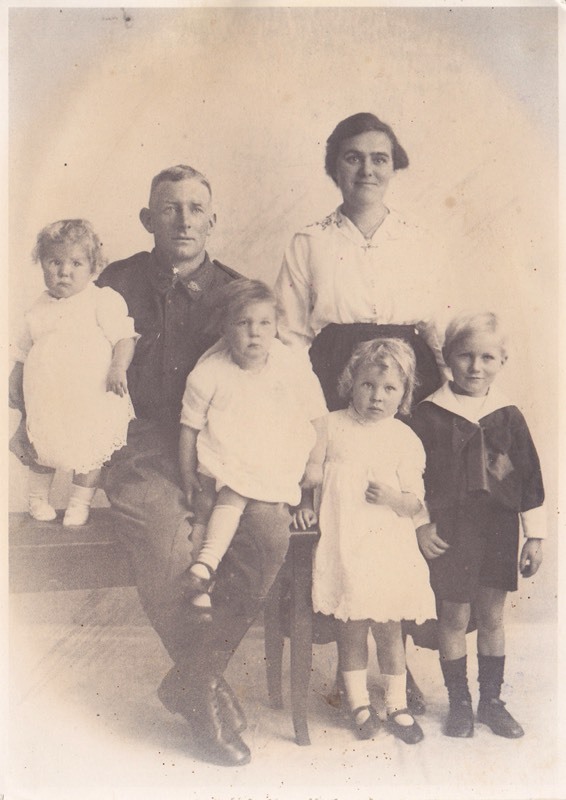 Along with many other Australian troops, Charles was waiting for demobilisation when Spanish Influenza struck. 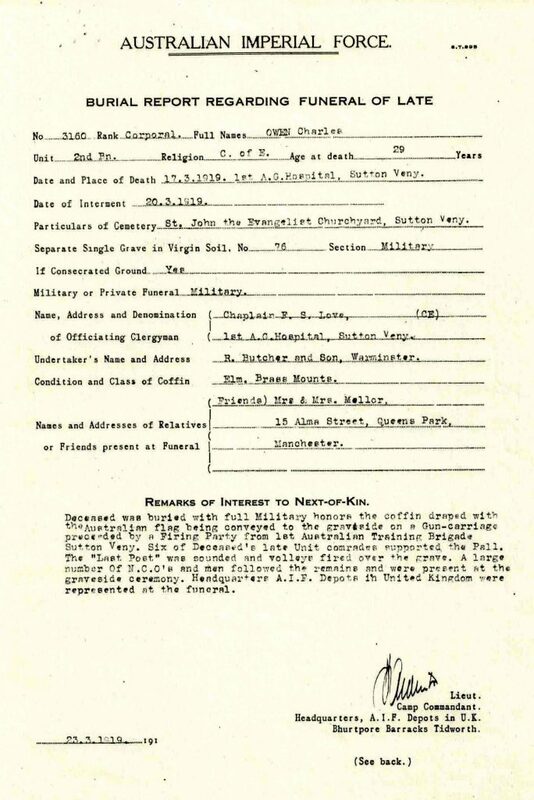 His Service Record indicates he was admitted to the military hospital at Sutton Veny on 15 March 1919 with the illness, but sadly died on the 18 March, aged just 29. Charles’ family in Australia were preparing his homecoming celebrations, when news of his tragic death arrived. His burial took place on 20 March in the Australian War Graves cemetery at St. John the Evangelist Church, Suttton Veny, grave No. 76. 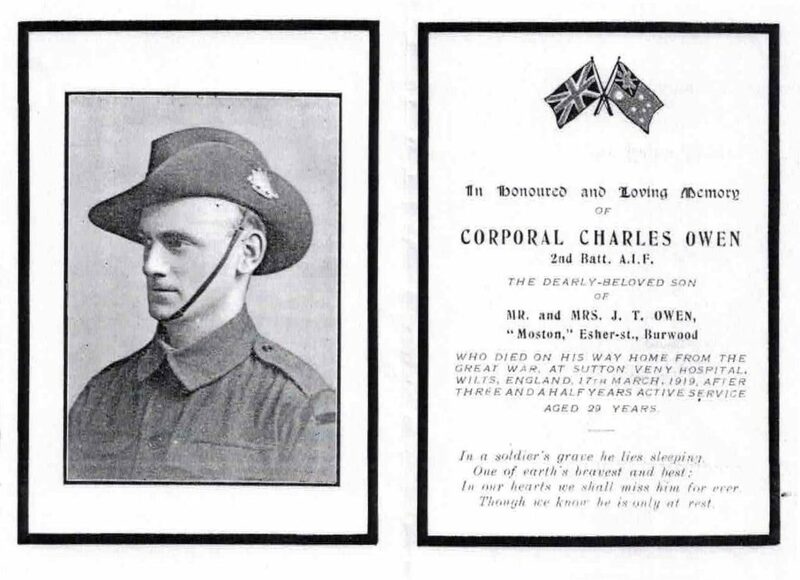 Charles’ name also appears on the Roll Of Honour at the Australian War Memorial. 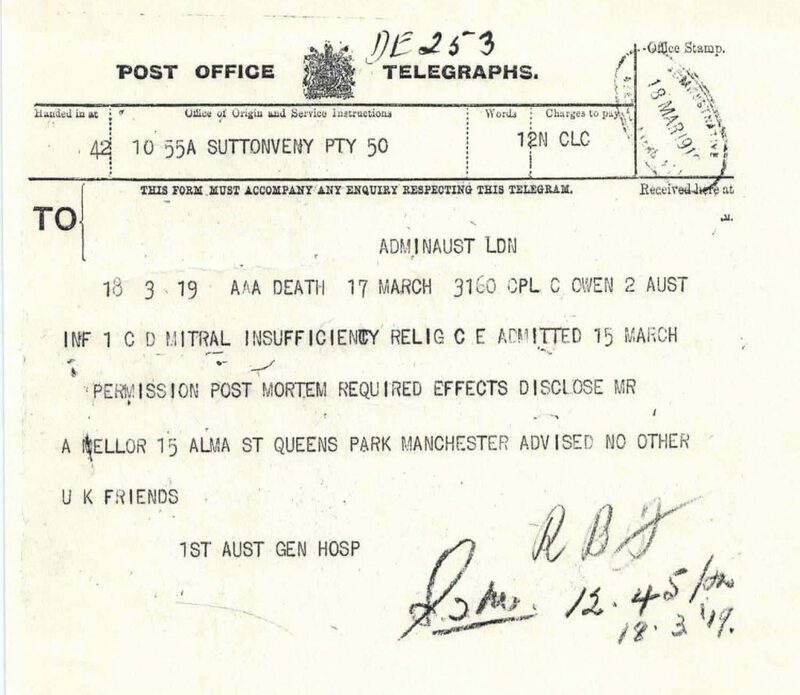 A military telegraph to London, sent from the Post Office at Sutton Veny and dated 18th March 1919. It makes reference to a Mr. A. Mellor of Alma Street, Manchester – who was presumably a family friend from their time in the UK. Charles’ official burial report, signed by the Camp Commandant at Tidworth Barracks, Wiltshire. Charles’ story has been included in The Western Front Diaries by Jonathan King, published by Simon & Schuster Australia.